Talamanca, Ibiza. Sa Punta Ibiza lies on the bay of Talamanca, offering dazzling sea-views encompassing Ibiza Town and the marina. A truly cosmopolitan restaurant that oozes class and offers a delicious international cuisine, Sa Punta is a classic Ibiza experience. Sa Punta Ibiza lies on the bay of Talamanca, offering dazzling sea-views encompassing Ibiza Town and the marina. A truly cosmopolitan restaurant that oozes class and offers a delicious international cuisine, Sa Punta is a classic Ibiza experience. Sa Punta Ibiza is a delight to visit. A celebrity favourite, think five star service and attention to the smallest detail. With a distinctly international menu, lovingly put together by the owner Rodolphe, prepare yourself for a warm welcome and exquisitely prepared quality cuisine. With lots of fresh seafood dishes, free-range meat and where possible, locally sourced fresh produce, the quality this restaurant offers is exhilarating. Sa Punta offers three dining experiences, Sa Punta Fine Dining, Ginger and Patchwork. All have a beautiful, soothing ambience with lots of light, subtle shades of cream and natural materials. The level of service is top-class. Sa Punta Fine Dining offers Mediterranean cuisine with resident Djs, giving each evening a distinct flavour. Add to this the superb outside terrace for pre and post-dinner drinks and dancing underneath the stars and Sa Punta is pure Ibiza magic. For a taste of the Far East is Ginger, open in the evening only, offering high quality Asian food, all fresh and hand made at the restaurant with a selection of their own special sauces. Dine on a selection of succulent wonton, gyosa or tuna sashimi and then sit back in a big Chinese armchair in this superbly stylish setting. Try Lebanese cuisine right above Sa Punta at the Patchwork Rooftop Restaurant & Bar. 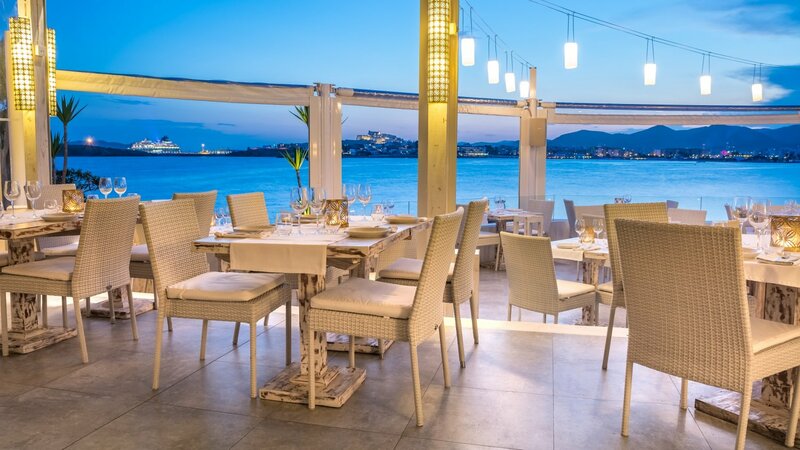 You are invited to enjoy the colourful decoration, exquisite cocktails and flavours, and stunning views across the water to Dalt Vila, in a relaxed dining atmosphere open in the evenings until 3 am. Call us on +34 971 19 34 24 or send a booking request below.